There’s nothing small or underground about these forms of resistance. But they still raise important questions about power and agency. Resistance is everywhere these days, and it begs analysis, especially in thinking about issues of power and agency. Nowhere is this more true than in Egypt, where protesters have exerted considerable agency in forcing changes, yet somehow they are unable to exert strong agency over the ultimate outcomes. In a now famous article, Lila Abu-Lughod challenged the social scientific community on the concept of resistance. what one finds now is a concern with unlikely forms of resistance, subversions rather than large-scale collective insurrections, small or local resistances not tied to the overthrow of systems or even to ideologies of emancipation. Scholars seem to be trying to rescue for the record and to restore to our respect such previously devalued or neglected forms of resistance. The trend to which Abu-Lughod was responding was inspired by James Scott’s Weapons of the Weak: Everyday Forms of Peasant Resistance (1985). Scott argued that peasants oppressed didn’t buy into the hegemonic cultural systems that justified their oppression–they just didn’t want to get themselves killed going up against heavily armed security forces of the state. Rather, he said, they engaged in everyday forms of resistance: refusing to marry their daughters to the sons of collaborators, work slowdowns, etc. What is the relationship between scholarship and theorizing and the world-historical moment in which it occurs? What is the ideological underpinning of scholarship that claims to bring to light such hidden acts of resistance and make them visible? What are the implications of studies of resistance for theories of power? Today, of course, we are once again in an era of large-scale resistance. The revolts and protests in the Arab world, the protests in Spain, Greece, and Ireland, the Occupy Movement are all acts of resistance quite different from both the peasant wars of the 1960s and 1970s, and the subaltern resistances tracked by scholars in the 1990s and 2000s. But this makes Abu-Lughod’s questions more relevant rather than less. 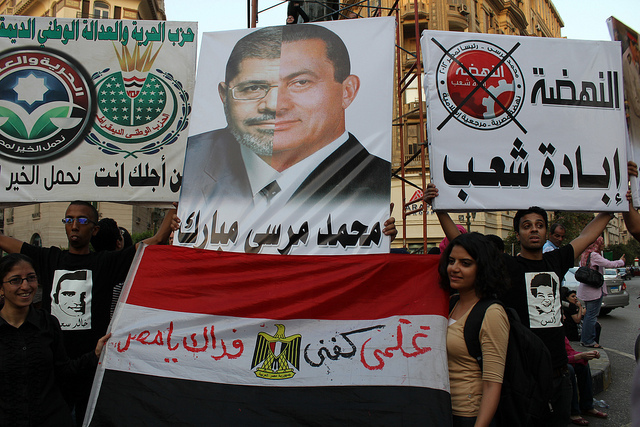 One of the articles, “Upending Infrastructure: Tamarod, Resistance, and Agency after the January 25th Revolution in Egypt” by Julia Elyachar, focuses on the efforts of the Tamarod movement to organize protests against President Morsi, which led to the military’s removal of Morsi and the eventual election of General as-Sisi. Infrastructure, of course, refers broadly to those processes, materials and technologies that enable the institutions we think of as social structure. Bridges, roads, electrical systems, power plants, communication satellites, irrigation canals, sewage systems–these are all necessary for banks to do business, companies to bring products to market, schools and government agencies to operate, and so forth. Infrastructure is a classic “public good”, a set of resources available to all and the use of which does not decrease its availability to others (Samuelson 1954; Stigliz 1999). At the same time, infrastructure can fail to fulfill the promise of connectivity (Harvey and Knox 2012); be designed to block, impede, or exclude flows of people, goods, and resources, as is most clear in apartheid South Africa and Israel/Palestine; or privatized in part or in whole, through the building of toll roads or the securitization of rising tuition in a public university. Recognizing communicative channels as a collective resource for all kinds of semiotic communication, Elyachar suggests we might think of sets of channels as infrastructure. Just as people don’t tend to think about infrastructures until they fail–a bridge collapses, a highway gets washed out, a power cable snaps–so communicative channels don’t get noticed until they fail. When Mubarak turned off the Internet and mobile phones, he inadvertently made visible the relational and multi-layered nature of infrastructures of communicative channels. Egyptians activated older technologies like boat phones and satellite communications. They created pirate and alterative infrastructures, patching together whatever worked to keep up contact with each other and with the outside world. It became possible to see how mobile phones, Internet, landlines, patterns of sociality in neighbourhoods, and marches that called neighbours and friends down to the street were working together as a communicative infrastructure. In Egypt these days, Tamarod is often seen as the dupe of the military, or of Egypt’s richest man, Sawiris, who claims to have secretly funded it. After all, Tamarod was led by people who wanted “freedom, bread, and social justice” and what they got is a revived military/autocracy regime. Alongside Elyachar’s essay in the special edition of History & Anthropology are pieces by Dan Rabinowitz on contemporary metropolitan protest in Tel Aviv, Dimitrios Theodossopoulos on anti-austerity indignation in Greece, Jacqueline Urla and Justin Helepololei on writing thick description and being engaged in Spain, John Gledhill on struggles by Mexican indigenous communities, and Sherry Ortner on American patriarchy. Exoticization involves idealizing resistance, or casting it as a unique event (whether positive or negative) and thus reducing its complexity to caricature, and minimizing social change as just performance. I fear Theodossopoulos would see my arguments about liminality as a kind of exoticization. I have written before about the relationship between the structures of social order and their relationship to resistance movements, and I will again, but I’m not sure that I need to abandon liminality and social performance as analytical tools to do it. While I recognize pathologization and exoticization as practices engaged in as part of the performances by opposition to the revolutionary movements in Egypt, I’m not persuaded by Theodossopoulos’s points. Indeed, he paints the process of exoticization with such a wide brush it seems to me that one could interpret Elyachar’s claim that “infrastructure is upended in uprisings” as exoticization (but she’s right). Nonetheless, it is a useful call to remember that we, as social scientists, must be careful not to fall into the trap of exoticizing or pathologizing social processes in our efforts to understand, interpret, and represent them. In this paper, I review recent contributions to theories of resistance and agency in the context of anthropology of Egypt. Drawing on ethnography conducted in Egypt after the January 25th Revolution and then after the election of Mohamed Morsi as President, I analyse the mass mobilization movement in Egypt called Tamarod. Tamarod led the effort to have twenty-two million Egyptians sign a call for President Mohamed Morsi of the Muslim Brotherhood to step down, and mobilized an estimated twelve million to come on the street for a mass demonstration on 30 June, after which Morsi was removed from power. Rather than critique the notion of Tamarod as resistance, as a dupe of the Military, or as the legitimate voice of the Egyptian people and their agency, I argue that Tamarod made visible, and rendered available for political goals, a social infrastructure of communicative channels in Egypt. More generally, the paper shows concretely, and as concomitant processes, how agency is embedded in infrastructure and how infrastructure is upended in uprisings. Scott, James. 1985. Weapons of the Weak: Everyday Forms of Peasant Resistance. Oxford University Press.